I live in Sweden and have been growing indoor Bonsai under artificial light for a while now, i started with HID lights but that setup got way to hot especially in summer time, many people came with the suggestions to have the trees outside when the weather allows, but i live in a small flat and my balcony is full with native trees already, and to be honest the summer is so short here that its IMO not even worth the hassle of taking them in and out anyways. So i have since been using CFL's with "ok" results (nothing like HID), i will now try the latest grow lights witch are LED. They are suppose to grow plants just as good as HID while using something like 1/3 to 1/2 of the power and with a lifespan of over 50.000h, they are marketed to throw of a fraction of the heat as well, all this should in theory make growing Bonsai indoors all year round much easier and accessible even in small flats like my own. And if all the hype is true this should make it possible to develop trees indoors very fast without a massive electric bill. The only downside i can think of is the high price of these new lights, but we will soon find out if its worth it or not. 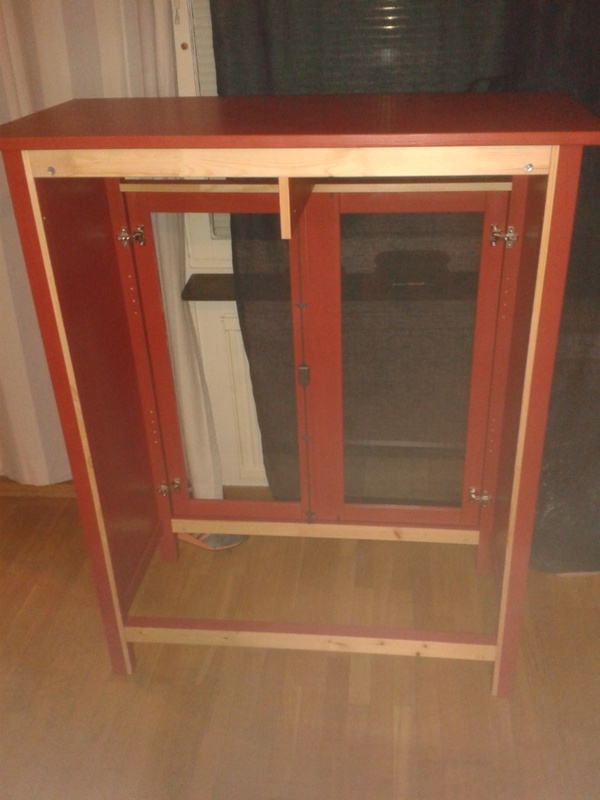 For this test i will use 2 cabinets with glass doors from IKEA to house the trees, the plan is to modify these cabinets in such a way that they work as growboxes but still look good, this is very important since they will be in my living room. I'm building these cabinets as we speak, will update with more info on the lights and start the testing when everything is ready. Worth mentioning is that i do not manufacture or sell the lights i will be using, these have been sent to me so i can test them for this application. Anxious to hear how these work for you. I'll be interested to hear how you will provide fresh, moving air for the trees when they are inside a glass-fronted cabinet. Please keep us posted. I imagine many of our indoor growers will be very interested. Jerry, thanks for dropping in hopefully these lights will be a game changer for indoor Bonsai, from what i understand LED has already completely changed the Aquarium hobby. Hope to see some pictures too. Not much to show right now but here is one of the cabinets, i will start the building and modifications after new years and hopefully have everything ready by mid January. 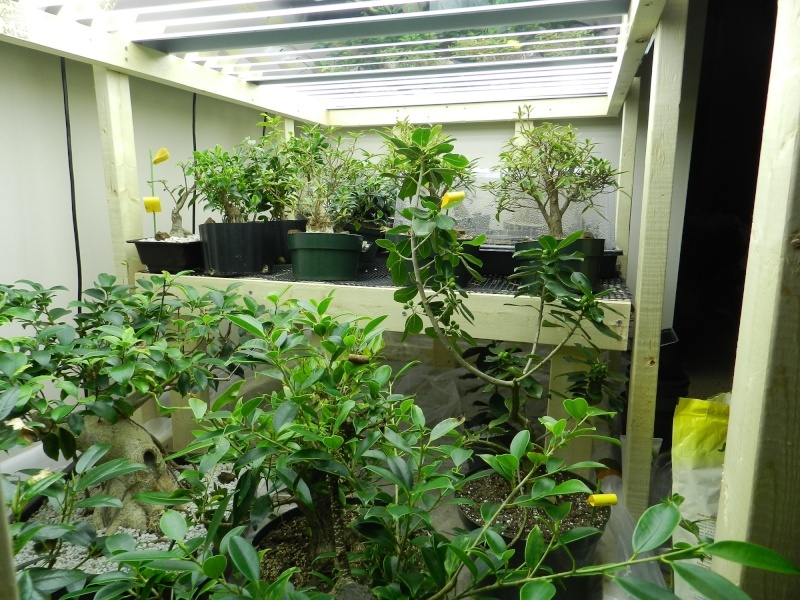 I grow a large number of orchids, and a few tropical trees under lights. Before you purchase your LED lights, I suggest getting feed back from others who have purchased them from the same manufacturer. 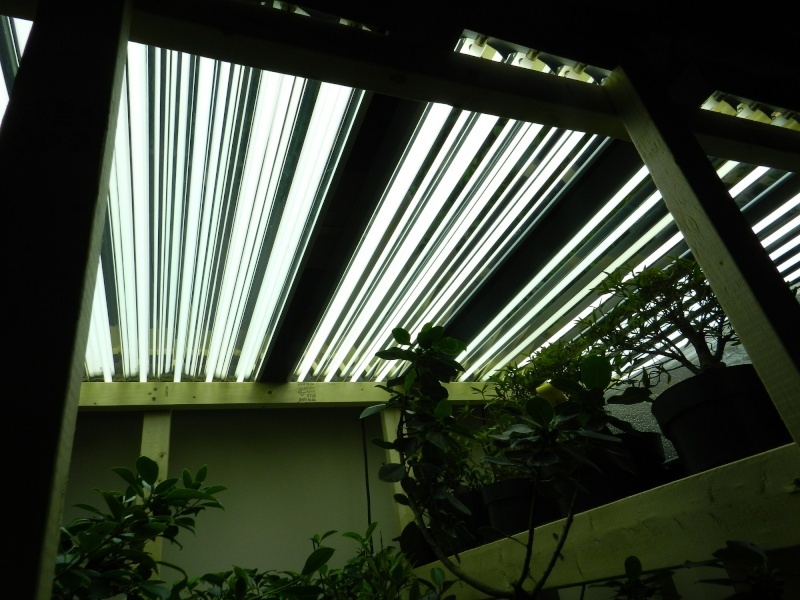 In theory LED should be perfect for growing indoors. My trials with LED in 2007 and 2011 were dismal failures. In the USA, most of the LED lights available were manufactured and assembled in China, and failed in less than 3 months. The sellers were co-operative, for one brand I tried, the seller replaced the lamp 3 times, then we gave up and I got a refund. For another seller, replaced it twice, when it failed the 3rd time, the seller refused to replace or refund for the product. When you find an LED assembly that actually works, it should be great, but the failure rate of Chinese manufactured lamps is unacceptable. You are in the EU, if you can find LED lamps made inside the EU, it may be great. Stop in at your local hydroponics stores. Get feed back about different available brands from sellers, ask them specifically about how often they have to return defective units back to the manufacturer. Also see if you can get feed back from customers using particular lamps. My light garden now is based on using T5 fluorescent lamps, I use 5700K bulbs, but any bulb with color between 5200 and 6700 should work well. I prefer the standard size available in the USA, 48 inches. An 8 lamp reflector, with 48 inch T5 lamps is a good replacement, when mounted at the same height as a 400 watt HPS grow lamp. It is not as cool as LED, but MUCH cooler than HPS. Every single unit I have purchased has performed, right out of the box. Leo, i am well aware of all you wrote and could not have said it better my self, have been reading a lot about LED's even tested one from China some years ago, that unit also broke down very very quick so i did never get a chance to really form a opinion about it ,but have heard of many people with similar story's and had actually thought of bringing this Chinese LED problem up later on in this thread, thanks for doing it for me! But since the tech looks to have matured a lot since, i thought i give it a new try and the lights i will be using are 100% NOT made in China and with the very best LED's and bins, so i hope this will be very interesting. More info on the lights will come when i am done building the cabinets and things start rolling. Leo, would it be possible to see a photo or a few of your current setup? If others would like to show there indoor gardens as well that would be awesome! Dreamcast wrote: Leo, would it be possible to see a photo or a few of your current setup? I've got 2 four foot four bulb T5's, and 2 6 bulb four foot T5 lights, for a total of 20 T5 bulbs above my trees. Ryan, Crazy! talk about a ceiling of indoor sun you got there, also looks like you have plenty of NICE material to work with for many years to come, Thanks for sharing! Any idea of the power draw for the whole setup? Dreamcast wrote: Ryan, Crazy! talk about a ceiling of indoor sun you got there, also looks like you have plenty of NICE material to work with for many years to come, Thanks for sharing! As to the power draw, I'm not so certain. It's not a whole lot, as the bulbs are just T5 fluorescents that don't take a lot of power. Interesting experiment! looking forward to your results. I made the switch to LED on my planted aquaria, my other hobby:), this past year. I am currently using LED strips from 2 different manufacturers...Current USA and Finnex...on four different tanks with mixed results. I suspect you are going to need the high wattage versions (30watts) to be successful. I would also be concerned about the optics...spreading of the light. IF you haven't already you might consider an adjustable mounting system within the cabinet to get the lights as close to the material as possible. There seems to be a significant decrease in the PAR value of the light as you move away from the focal point. What is the temperature(K) of the lamp you will be testing? If you are using T5HO lamps each lamp is 54watts. 20X54= 1080watts...pretty significant power draw when compared to LEDs...most are in the 1-3 watt/lamp category. Ryan...Multiply it out by the number of hours you run the lights per day and the number of days in month and I bet you have impacted your (or your parent's) electric bill noticeably! Let alone the cost of replacing the T5 lamps every 6 months...at which point they have lost over 50% of their intensity. jgeanangel wrote: Interesting experiment! looking forward to your results. I made the switch to LED on my planted aquaria, my other hobby:), this past year. I am currently using LED strips from 2 different manufacturers...Current USA and Finnex...on four different tanks with mixed results. I suspect you are going to need the high wattage versions (30watts) to be successful. I would also be concerned about the optics...spreading of the light. IF you haven't already you might consider an adjustable mounting system within the cabinet to get the lights as close to the material as possible. There seems to be a significant decrease in the PAR value of the light as you move away from the focal point. What is the temperature(K) of the lamp you will be testing? Thanks for stopping by and nice to have you along for the ride, hopefully we both (and others) will learn something from this test and i would love it if this thread can benefit others in there search for good lights. Looked at the webpages for Current USA and Finnex looks like high quality Aquarium lights, how would you say they preform compared to the lights you had before? The ones i will be using are in fact higher power LED units witch are meant to compete with HID/MH lights, and they are suppose to put out very high PAR values at a good distance, but i will definitely take your advice and build the cabinets so the light distance can be adjusted if needed, thanks! I will be trying both white and mostly red & blue LED units to see witch is the best for this application, i hope to have my camera back from service this week so i can take some photos and also share more info on the units i will be using. I see many i would love to work on my self, i really envy you guys in the southern parts of the US, i can only dream of finding the same quality material here in Scandinavia, wanna donate a couple of trees? Yvonne, Really? and the material found at this shop is it the "standard" imported S shaped trees or more natural looking trees? Yes...this is the shop...they also have good material, or can take it home if you ask....By the way, this is were "my" bonsaiclub meet every month. Trust me John, I've been doing this for 5 years now. I'm well aware of the electric bill, but the lights don't affect it all that much. The way we pay our bill is set up so that we don't pay monthly, it's split up over the year. I'm still not convinced on the high cost of LEDs, so I'll stick with what works best for me right now. This is very interesting and I'd like to see how this works out. I have done a bit of indoor growing, but I now only keep a few tropicals in a south window. The only input I would like to add if I may, is that efficiency is of the utmost concern, of course. 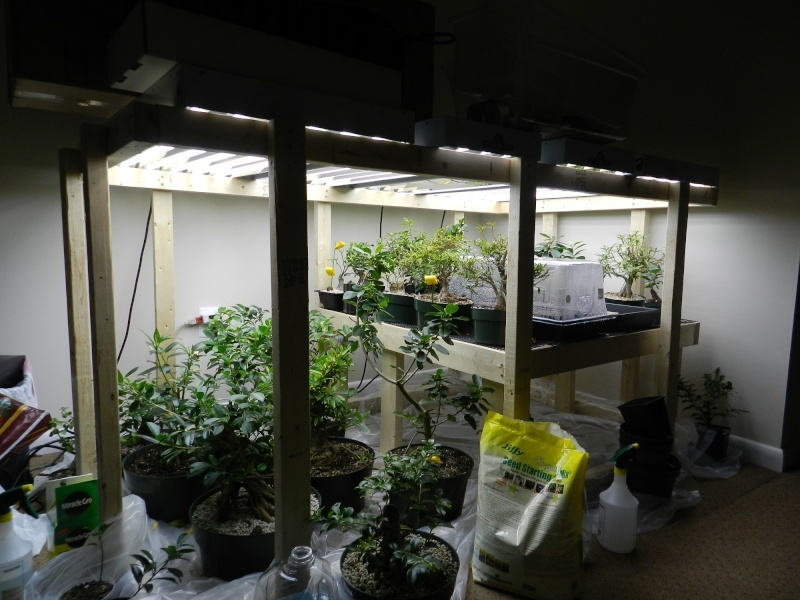 Using Ryans setup for example purpose, a good setup and you've done a great job, but there is alot of light spilling outside the grow area. You can get better usage by rearranging the fixtures. The tubes light their length and also have a lateral spread. Take two fixtures out of the ceiling and install them on each end in an upright positon and turn the two in the ceiling lenghtwise down the middle. This arrangement gives full sun lighting for all periods of the day, not just high noon. You will have better penetration and when you snap a pic they won't look all gloomy down below. Wrapping the two walls with a light weight builders foil, the white is best, will keep the light in the box, very important when you're paying for the juice. Just my two cents, but I would design a cabinet the same way, lights up the sides and across the top, all white inside and reflective glaze on the inside of the glass. There are so many folks trying to grow trees indoors and so many trees being sold to meet the demand. Something on this order must follow the market. I always tell folks, Yes, you can, but you got to have a setup. RKatzin wrote: This is very interesting and I'd like to see how this works out. I have done a bit of indoor growing, but I now only keep a few tropicals in a south window. The only input I would like to add if I may, is that efficiency is of the utmost concern, of course. Interesting about turning the lights on their side Rick. You really think that would be beneficial?? I'm sure it would help prevent inner branches from dying off due to lack of light. Hi Ryan, Yes side lighting works better than just overhead. With artificial lighting your plants must be close to the bulbs. You can either raise the plants or lower the lights. I've used upside down pots to raise plants and my lights were on cables and pulleys so I could raise and lower them as needed. The trees on the floor get very little benefit, but the table end looks good. I think you would see tighter, more compact growth and more backbudding with side lights. Think about your typical day, the first few hours the sun is coming in from the side and in the afternoon, also. Ever seen a suntracker? It's a gizzmo that moves your bulb in an arc across your room to simulate the movement of the sun. I just put bulbs all around for the same effect. RKatzin wrote: Hi Ryan, Yes side lighting works better than just overhead. With artificial lighting your plants must be close to the bulbs. You can either raise the plants or lower the lights. I've used upside down pots to raise plants and my lights were on cables and pulleys so I could raise and lower them as needed. I'm considering hanging some of the fixtures on their side, but I'm not sure how to go about setting them that way. I've been searching the net without finding much information about whether or not vertical hanging really helps, though.